Those who don't find time for workout, will have to find time for sicknesses. 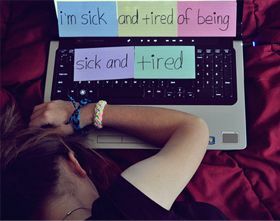 I'm tired and sick of being the one who cheers up people when they're sad... because when I'm the one in need of someone, nobody is there to make me feel better. The thought of you makes me sick. I can't even bare to begin. I need to remember how it feels to be loved again. But the thing is, I just can't pretend. I can't just let this go. I can't act like you never cheated or that you never broke my heart. I can't act like I didn't want to cry whenever I looked into your eyes. I say that I don't care anymore, but really, I care more than ever. I think of all the good times we shared, how much we cared, and how constant we laughed. But then I just realize, all over again, what you did to me and why you can never be forgiven. It's my turn to leave you, just like you left me. I'm the opposite of home sick, I'm sick of being home.